Lakme Fashion Week 2018 has had a star-studded line up of Bollywood celebrities, stopping for various designers, including those who have debuted their first collection for the first time until now. From late Sridevi’s daughter Janhvi Kapoor making her runway debut, to Varun Dhawan and Karan Johar coming together for long-time friend and designer Kumal Rawal, Lakme Fashion Week 2018 seemed to be a star-packed event with celebrity showstoppers and celebrity guests. The five-day show held in Mumbai started on August 22, 2018. Check out the photos below to see who played model during the Lakme Fashion Week 2018. Parents-to-be Angad Bedi and Neha Dhupia made a runway appearance for Payal Singhal in matching traditional attires with floral embroidery. Kareena Kapoor Khan stuns in a silver gown as she walks for designer Monisha Jaising at the LFW 2018 Finale. In a true diva style, the actress walked the ramp with elegance and amazed the audience with her stunning walk..
Shahid Kapoor in Amit Agarwal during LFW 2018 in an Indo-Western all-black outfit with shimmer on it. Karisma Kapoor walked the ramp for Arpita Mehta. The actress dazzled in a black saree with transparent pallu and minimal designs and sleeveless blouse. Janhvi Kapoor debuted as the runway showstopper for Nachiket Barve. The debutante looked stunning wearing a floral lehenga, matching choli and pink dupatta to go with it. Shruti Haasan looked beautiful in a three-layered full sleeved frill dress as showstopper for designers Saaksha and Kinni. Malaika Arora looked regale in designer Anushree Reddy. The stunning actress/model wore a vibrant lime green lehenga choli with silver embellishments and a matching light dupatta. Bipasha Basu walked for the label Ruceru in a lingerie-style top, matching sequined cape and A-line skirt, with jasmine flowers on her ears. Neha Sharma in a stunning Sita Mikhail’s wine red flowy gown with metallic embellishments and plunging neckline. Dia Mirza walked for Sammohi by Moksha and Hiral in an ensemble featuring a sleeveless blouse, flared skirt with floral work and a dupatta with metallic work which she draped Gujarati style. Kangana Ranaut made a runway appearance for designer duo Pankaj and Nidhi. She dazzled in an embellished royal blue sleeveless dress with floor-length cape. Being associated with a smartphone brand, the actress rightly posed during her showstopper appearance. 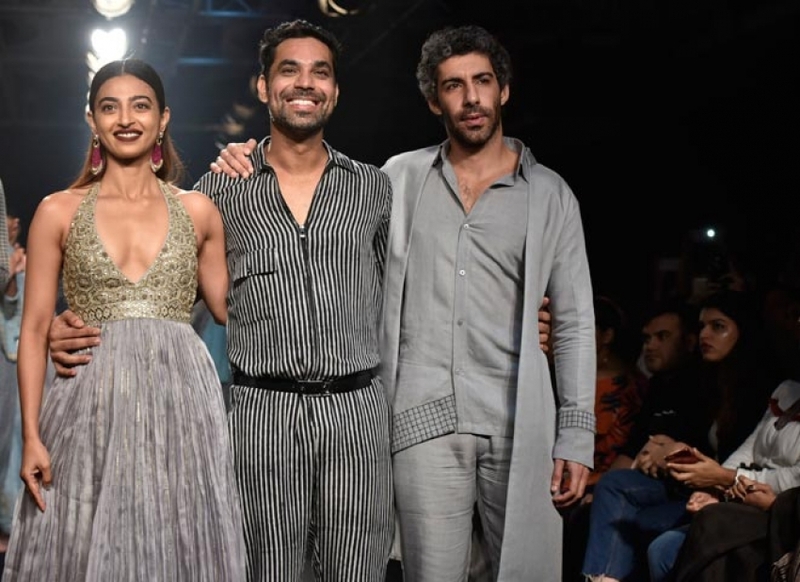 Radhika Apte and Jim Sarbh turned showstoppers for the designer Punit Balana.